Homecroft, Indiana, is a quaint town in Marion County. What’s unique about this place is that it’s part of Indianapolis, yet it functions as an independent town. Homecroft has a population of approximately 750 citizens, a factor that accentuates its small-town environment. Residents call Homecroft a “perfect place to grow,” due to its small, tight-knit community. Since it’s been in existence since the early 1920s, this village holds onto years-long traditions like having police officers give out candy on Halloween. Along Madison Avenue, you’ll find places to meet your basic needs like banks, convenience stores, chain and local eateries, an animal hospital, and more. For more entertainment options, you can make a three-mile trip to Greenwood Park Mall, a mall with several popular restaurants and retailers, a movie theater, and other venues. Perry Park is a great place for families. It has an ice rink where you can watch ice sports along with a concession stand and an aquatic center. The park also has a playground, shelters, tennis courts, and a basketball court. Another family-friendly place is the Otte Golf and Family Fun Center in Greenwood. In addition to an 18-hole golf course, the facility has a snack bar, batting cages, and a driving range. If you enjoy fishing, you should check out Little Buck Creek. Some of the types of fish you’ll find include bass and bluegill. Homecroft has one public elementary school and one kindergarten academy. 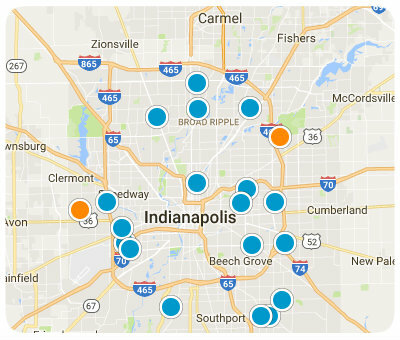 Since this town is part of Indianapolis, you have other schooling options throughout the city like private schools and charter schools. Homecroft real-estate properties possess ancient styles like the Colonial Revival and the Tudor Revival. These Homecroft homes are single-family dwelling and apartments with one to four bedrooms and one to three bathrooms. Some residences include convenient amenities like washers and dryers, stainless steel appliances, and breakfast nooks. Consider moving your family to Homecroft. Its small population, unique government, and excellent schools make it a homey and welcoming place in which to live. If you have questions regarding homes for sale in Homecroft, Indiana, don’t hesitate to contact us.